Interview: Are Liposome-encapsulated Vitamin C and/or the Levy Multi-C Protocol more effective than Intravenous Vitamin C? Introduction: Below is part one of an interview between Dr. Richard A. Passwater, Ph.D. with Dr. Thomas E. Levy, M.D., J.D. that featured on the Wholefoods Magazine website on July 23rd 2018. We have been focusing on the health benefits of increased levels of vitamin C in the blood. Now it's time to focus on what is even more important - increasing the amount of vitamin C that gets into the cells and its organelles (specialized subunits within a cell that have specific functions). Bioavailability is more than measuring how much of a nutrient is absorbed into the blood, it is measuring how much gets into the cells. While Intravenous vitamin C (IVC) increases blood levels of vitamin C and has been producing good results, it turns out that liposome-encapsulated vitamin C, even though taken orally, is more efficient at getting into the cell where it can do its work. Nevertheless, IVC, liposomal C and standard vitamin C supplements can all work together. What is the health advantage of optimizing your vitamin C intake and what is an excellent way of achieving optimization? In my opinion, for the young and healthy, any form of vitamin C above 500 mg will likely meet their minimal needs until they come under stress or are attacked by a virus or worse. I have always recommended either 4,000 mg per day in divided doses or whatever their supernutrition plan found was their personal optimal level (1). For those fighting stress and disease, there is considerable evidence that high-dose vitamin C offers substantial additional health benefits (2). 1. Vitamin C can kill cancer cells without harming normal cells (3). 2. The biochemical mechanisms involved in vitamin C killing cancer cells (4). 3. Vitamin C reduces Prostate Specific Antigen (PSA) and alkaline phosphatase (ALP) levels in prostate cancer patients (5). 4. Optimizing blood levels of vitamin C by divided doses and adding liposomal C (6). Of course, this research is beyond what is commonly considered the standard nutritional actions of vitamin C and is considered a supranutritional action by most. This interview is a discussion between two scientists about the ongoing research on vitamin C (ascorbic acid) and should not be construed as offering medical advice to anyone. Information in this interview is intended for educational and scientific purposes only. It is not intended as medical or nutritional advice for the treatment or prevention of disease. In the United States, the Food and Drug Administration regulations state that any claim that a nutrient treats a disease, immediately and arbitrarily, by definition, changes such nutrient into a drug and subject to all drug regulations. We will be discussing ongoing scientific research, not discussing medical advice. For medical advice, please consult your personal health care practitioner. Nonetheless, you may find our discussion of this ongoing research interesting. Now, the question is "How can we optimize the uptake of vitamin C into all cells?" 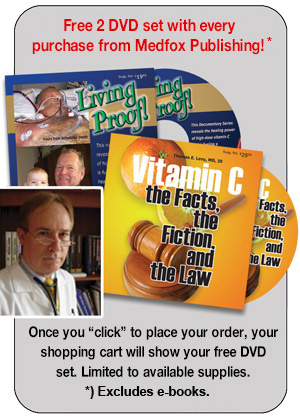 While discussing Dr. Steve Hickey's research on the optimization of blood levels of vitamin C, the clinical studies of Dr. Thomas E. Levy and his "Multi-C Protocol" kept coming to mind. We first discussed this in 2012 (7). In 2007, we had discussed how vitamin C can protect the arteries from cardiovascular disease (8). It's time to call upon Dr. Levy and update his research with the "Multi-C Protocol." Thomas E. Levy, M.D., J.D., is a board-certified cardiologist and the author of "Optimal Nutrition for Optimal Health" (Keats Publ. 2001), "Stop America's #1 Killer: Reversible Vitamin Deficiency Found to be Origin of ALL Coronary Heart Disease" (Medfox Publishing, 2006), "Curing the Incurable: Vitamin C, Infectious Diseases and Toxins" (Medfox Publishing, 2002), "Hidden Epidemic" (Medfox Publishing, 2017), plus three other ground-breaking medical books. He is one of the world's leading vitamin C experts and frequently lectures to medical professionals all over the globe about the proper role of vitamin C and antioxidants in the treatment of a host of medical conditions and diseases. Dr. Levy earned his B.A. in Biology in 1972 at Johns Hopkins University, his M.D at the Tulane School of Medicine in 1976, and his J.D. at the University of Denver College of Law in 1998. Most of his work has centered on how to restore and maintain good health in the face of the many different forms of toxicity that all of us face, typically daily. He no longer has a clinical practice of medicine and cardiology. Rather, he limits himself to research and writing. Passwater: Welcome back Dr. Levy. We want to chat with you about your "Multi-C Protocol." But first, can we update a little on our previous conversations? We first talked about the importance of vitamin C to the arterial wall and how even temporary shortages of vitamin C can initiate the plaque-forming process of cardiovascular disease. At that time, the most recent study showed that a report published in the September 2006 issue of the British Journal of Nutrition based on a prospective population study of 25,663 men and women aged 45-79 found that having higher plasma vitamin C (ascorbic acid) levels is associated with a lower risk of developing coronary artery disease independent of traditional risk factors and C-reactive protein (CRP) levels (9). Has more supporting research been published since then? Levy: Glad to be back. There are now some additional studies further documenting the impact of vitamin C on heart disease and longevity in general. Of note, it is generally the studies that show higher plasma levels of vitamin C that most clearly indicate a corresponding decrease in cardiovascular and all-cause mortality. A better diet that has more vitamin C than a lesser diet does not clearly show such a decrease in mortality, largely because the human being needs grams of vitamin C on a daily basis for optimal function and longevity, not just milligrams, which is usually the amount of vitamin C present in even the best of diets. This is further supported by our loss of the function of the L-gulonolactone oxidase enzyme function in the liver, which would otherwise allow us to make and secrete multigram amounts of vitamin C from the liver into the blood on a daily basis, as most of the animals in the wild can do. This lack of endogenously-formed C has human beings resolved to accepting the symptoms and consequences from multiple chronic diseases during the latter half of their lives as their unavoidable fate. The fact that nearly all humans share this fate leads to the acceptance that it is "normal." Levy: The results were dramatic and consistent. Using high doses (50-100 grams at a time) of vitamin C intravenously, two cases of West Nile virus and two cases of chronic infectious mononucleosis were completely resolved in three to four days, even though all four individuals had been very ill for months. Two were students who had already dropped out of college due to incapacitating fatigue and malaise. One 15-year-old girl in Colombia, South America presented to me with dengue fever already demonstrated blood in the urine, indicating that the infection already was having significant early systemic consequences (hemorrhagic). This young lady was completely cured in two to three days by taking a total of 10-15 grams of liposome-encapsulated vitamin C orally during that period. As well, four to five days of high doses (50 grams at a time) of vitamin C intravenously resolved a case of acute Lyme disease. But take note that this was an acute presentation; chronic cases of Lyme are more resistant to all forms of therapy than the acute cases, although many will respond and even resolve when IVC is pursued in high enough doses for long enough periods of time. Passwater: You mentioned liposome-encapsulated vitamin C, otherwise known as liposomal vitamin C. Our 2012 interview may have been one of the first articles to discuss liposomal vitamin C in the general literature. Some readers still may not be familiar with this form of a vitamin C supplement. Please explain what it is and when it may offer health advantages. What is also important to understand is that a bilayer of phospholipids surrounds all the subcellular organelles, with the mitochondria and the nucleus having double bilayers. This allows the liposome to offer a unique delivery of its payload not only into the cytoplasm, but even into these organelles by a reverse pinocytosis (pinching off) mechanism. Levy: Basically, the liposome permits a deep intracellular delivery of its contents via three mechanisms. (Please see figure 4.) When dealing with payloads comprised of nutrients like vitamin C, liposome-encapsulated delivery offers advantages that are not even offered by intravenous delivery, long considered the "gold standard" for nutrient and supplement bioavailability. Any delivery system that can achieve delivery of its payload (in this case vitamin C) into the cytoplasm, or even more deeply into the mitochondria, endosomes, or nuclei, is nearly always the most desirable way to put that payload into the body, especially without the consumption of energy, or with the relatively minimal consumption of energy. Passwater: This is extremely important. The objective is not just to increase the level of vitamin C in the blood, but to get as much vitamin C into the cell interior and the organelles within the cell interior as possible. Levy: It is of interest to know that liposomes imitate the way in which cells throughout the body communicate and transfer various substances. This is achieved via a class of agents known as extracellular vesicles, also known as membrane vesicles. Classified largely by size, these vesicles consist of microvesicles, exosomes, apoptotic bodes, argosomes, and liposomes. They all have the lipid bilayer membrane structure, allowing the transfer of contents, including RNA, immune factors, and even factors involved in stem cell function, between and among the cells of the body. Furthermore, because of the typical size of liposomes (100 to 200 nm) they are able to pass through many of the pores of a cell, in addition to the reverse pinocytosis process noted above. This means the delivery of the payload is energy-sparing, and energy is not consumed in order to get an energy-delivering substance like vitamin C inside the cell (or the subcellular organelles). Even intravenous vitamin C requires energy to realize the presence of reduced vitamin C inside the cell. This is probably a major reason why oral liposome-encapsulated vitamin C appears to have comparable clinical effects to much larger doses of vitamin C given directly intravenously. Passwater: This point is often missed. Passive entry not requiring energy - which may not be adequately available at the functional site and time - is very advantageous to getting the optimal amounts of vitamin C where it will be used. "Unshielded" vitamin C in the form of ascorbate mostly requires active transport which does require energy utilization. Particle size is also very important. Levy: Exactly! As you said earlier, the goal is simply NOT high plasma levels of vitamin C, as is readily achieved with intravenous vitamin C. Instead, the goal is sufficient amounts of vitamin C entering the cell and its interior components. When liposomes eventually reach the circulation, as they will when enough is taken, the thoracic duct will deliver these liposomes directly into the circulation. When this occurs, the liposome will largely disappear as they enter and/or deliver their contents into cells throughout the body. This was part one of an interview between Dr. Richard A. Passwater, Ph.D. with Dr. Thomas E. Levy, M.D., J.D. that featured on the Wholefoods Magazine website on July 23rd 2018. more articles from Dr. Passwater can be found on the Wholefoods Magazine website.